Salam Alaikoum, We are three sisters - Latifa, Souad and Fatima Zohra - from Marrakech and have taken care of our sick mother together. 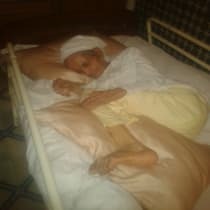 Mother has Alzheimer's for years and can hardly move: she is lying on bed almost all day and has lost weight a lot. We must feed, dress, change and try to let her walk a bit. Over the past week, she has had a virus infection: zona or shingles. As we hardly work, no money comes in and we depend on others. Now we need money for medicines, replacement products, research, physicians and physiotherapy. We ask you: Support us and help to take care of mother.